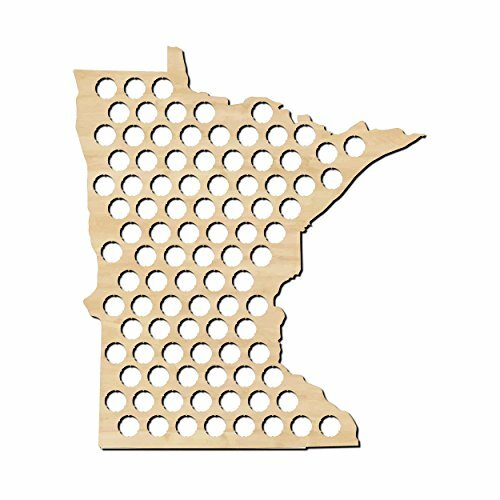 Minnesota Beer Cap Map - MN Craft Beer Cap Holder, Gifts for Him - BeerRevolt! INGENIOUS DESIGN: Holds over 50 beer bottle caps snuggly. Simply push the cap from the back and display your favorite brews. MADE IN THE USA: Proudly designed and produced in the United States of America! PERFECT GIFT: The best gift you can get for a craft beer enthusiast, home brewer, groomsmen, man cave, dad, or grad. The perfect way for any beer enthusiasts to display their favorite craft beers. This cut out of North Carolina will delight everyone from the homebrewer aficionado to the Joe down the street who just likes a pint in the pub. Perfect for a man cave. Make an amazing personalized gift. This craft beer cap map is perfect for a man cave, groomsmen gift, father’s day, or birthday. Give him that WOW feeling. The holes are the perfect size to hold all of your favorite caps. Just simple push them in from the back and hang on the wall. It is made from high quality light 5mm birch plywood with semi gloss finish. Everything is cut with a high precision laser. Finishing nails are included so you can hang your North Carolina beer cap map right away. There are several small holes to make hanging very easy. CUSTOMER SERVICE – You Love Them Or Your Money Back For Life – We Keep Our Promises To Our Customers And Treat You Like Family! HIGH QUALITY LIGHT WEIGHT WOOD: made with high quality 5mm birch plywood. Light weight to make hanging a breeze. You Love Them Or Your Money Back For Life – We Keep Our Promises To Our Customers And Treat You Like Family!